Roly Strachan was a Clivia grower whose named plants' unique coloration sets them apart from the many other South African cultivars. Yet many of these special plants might have languished in obscurity, hidden from or lost to the Clivia world, had it not been for the visits of a “neighbouring” Clivia lover and enthusiast, Val Thurston. This article presents a concise history of these most special plants. Roly's collection began with a simple start. He collected a few Clivia from the wild in the Ncalu bush near the farm where he lives with his wife Barbara, in the area of Ixopo in KwaZulu Natal. (This is inland of the sea and south of Durban, see map.) Roly planted these habitat Clivia under trees on his property. This was in or around 1978 (approximately 35 years ago - maybe more). According to Roly, these original 4 to 6 plants were fairly average orange flowering Clivia miniata. Left to themselves, they self pollinated, or perhaps cross pollinated among themselves, and produced seed. These seeds self-sowed and more plants grew. Over the years, the original plants and the mature seedlings all produced offsets and grew into large clumps. Roly began to divide these and plant them into the bushy areas under the fir trees along the 500-metre driveway on his property. He also gathered their seed, germinated them and planted the seedlings among the other plants. By 1990 the Clivia were fully naturalised under many trees all over his large property, and probably numbered in the thousands. After several years Roly noticed that some of the Clivia had special flowers: pastels and other interesting colours. These had appeared in his garden sporadically among perhaps 10,000 plants growing under the trees. Roly joined the local KZN Clivia Club in 1998, and other Clivia enthusiasts started visiting his collection. He continued to divide more and more clumps until he had utilized every bit of shade on the large farm property around his home. Among the early visitors who came to admire Roly's collection was Val Thurston, a 'neighbour' from 170 kilometres away. She first visited Roly in 1999, after meeting him at a KZN Clivia Club meeting the prior year. Together they went to look at his Clivia, and walked the many lines of plants. Among the more common orange-flowering forms, they took note of the ones with unusual colour flowers. The first of these was a lovely broad petalled white throated orange Clivia - which Val asked to buy a sucker of on the spot. Roly said she may take the whole plant, as long as she returned him an offset. This she did. Val named this first clone Roly’s Chiffon. Walking further down the lines, Val selected others for her garden, making sure to leave some suckers of each one for Roly. Val suggested that he replant these special clones closer to his house, where they could be more readily enjoyed, and label them. He did so. Although Chiffon was prime among Val's first selections from 1999, many of which she named after fabrics, in 1999 she also collected Organza –a very attractive creamy/orange pastel, Chartreuse, a dark orange with green centre, and Taffeta, a pastel orange with green centre. Chiffon is considered the best among these clones; it has the broadest tepals of the group, and has won first place award at the Conference 2002 Show – Any Other Colour 2 umbels. A plant selected by Sean Chubb, Roly’s Delight, which is a lovely creamy pastel orange with cream stripes down the petals, won Runner-Up to Best on Show at the KZN Miniata September 2005 Show. Organza was also placed Runner-Up in 1999 at the KZN Newcastle Miniata Clivia Show. 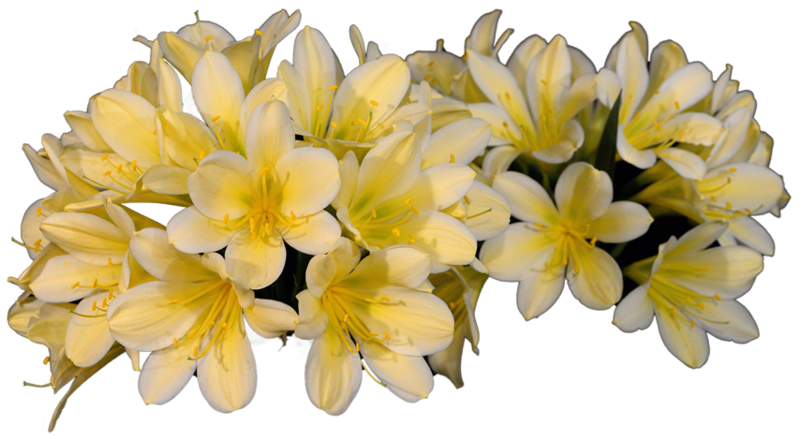 Over the coming years Val and Roly continued to walk the lines together, and select out special Clivia. In most cases Roly replanted a division of each new found clone into his special collection by the house. In 2000 Val selected Harlequin – a narrow petal Picotee, Kaleidoscope, a small bloomed pastel with mixture of dark and light oranges and cream, and Muslin – a pastel with cream stripes running up the petals, returning to fabric-based names. These were followed by Denim, Crinoline and Brocade - in 2001. In 2002, the collection was supplemented by Silk, another creamy pastel and in 2005, Crepe, a very attractive pastel with lots of cream and a dab of orange from the middle to tips of the petals . As for the clones with creamy orange florets with white stripes down the petals, Val believes that these all came from the seed of one plant, from which Roly collected the seeds and planted out the seedlings some years prior. As in those early years Roly did not keep records, it is unclear, but it is certain that all the clones are closely related. 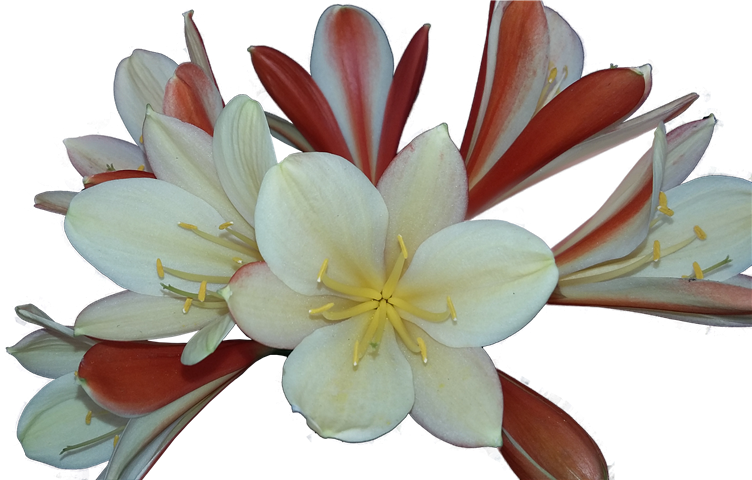 Around the time that Val selected out the named clones, Roly's involvement with the broader Clivia society through the KZN club led him to acquire many other Clivia: yellow flowering Clivia, broad leafed Clivia, peaches, et cetera. These he planted out into his garden along with his other plants. Over the subsequent years their genes were undoubtedly mixed into the collection by the wind, the birds, the bees... but after the initial cloned were selected out. By this time Roly had also stopped growing out and replanting the seedlings, and as the many visitors had selected and removed the majority of the Clivia with interesting flowers, now the majority of the remaining plants had the normal orange flowers of the original wild-collected plants. Roly and Val continue to walk the lines, and on the rare occasion that they do find a Clivia with interesting colours they mark it, and Roly puts it under the shade cloth with his special collection where he lets them inter-breed. The work with those first selected named clones continues to yield wonderful results. In addition to Sean Chubb's award winner, Val's Chiffon crosses and selfings have produced some really nice F1 generation seedlings which she is now crossing back onto Chiffon, and also crossing with Chiffon, in hope to further bring out the broad-petalled white-throated colouring. There are a few green throats within the named Clones, including Taffeta, but not a lot of breeding has been done with them yet. These green throats have a habit of being good one season and not very green the next. Perhaps the best among them is Chartreuse, which was very green when found, but unfortunately suffered rot and has not flowered again. It had a very dark green throat and stood out in his mass of plants. Among the Chiffon F1s of note, are Reflection and Poise, bred by Val Thurston, and the aforementioned plant of Sean Chubb. I am sure much promising work with these clones lies ahead. Roly and Barbara Strachan have lived and farmed in the Ixopo area of KZN for the past 40 years: Here is what Roly has to say about his adventure with clivias, "I have been propagating clivias since my interest in clivias started during 1980. Since Val has taken an interest and encouraged me in this venture I have started selecting and marking plants with special flowering features, I am now in a position to sell plants and seed on a large scale. This venture gives me a great interest and keeps me healthy and young for my 94 years." 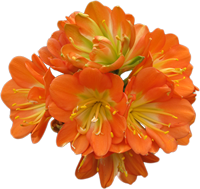 Roly and his late wife Barbara were very generous during Conference years, opening their home to all Clivia lovers, growers and enthusiasts. 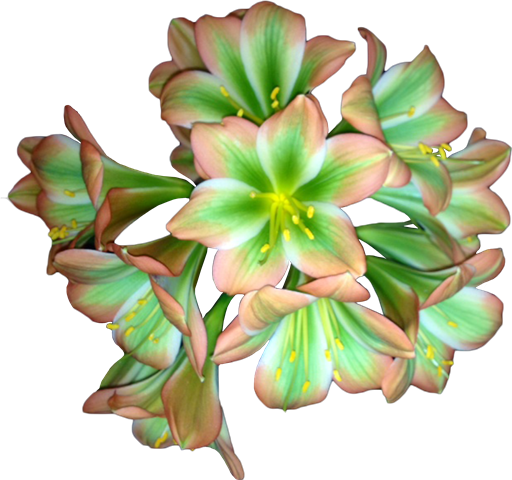 Many overseas visitors were presented with a Clivia of their choice on these visits. Delicious eats and lunches were provided and all were made to feel special and welcome to wonder around his amazing Clivia collection. His collection and their offspring have spread throughout the world with many exciting flowerings from the famous Chiffon line gracing Clivia collections. To date at the age of 94 Roly is the oldest member of our KZN Clivia Club. Sadly on 8 July 2014 Roly passed away peacefully with his family at his bedside. His legacy will live on with Roly’s Chiffon and the many other exciting new generation crosses being produced from seed worldwide. A wonderful, kind and generous person whose passion for clivia will make a difference for generations to come.